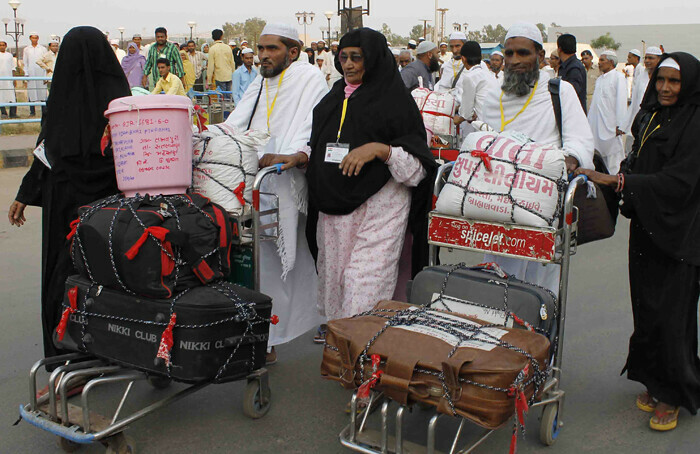 While Haj yatra is on and 6,000 Haj yatris are in process to leave for Haj from Ahmedabad airport, following details about Haj yatra and central government’s spending on Haj yatra are interesting. In this article, there’s also a comparison between the figures of central government’s spending for Haj yatra and for Kailash Mansarovar yatra. The minister gave following detail about central government’s expenses for Haj. However the figures presented above do not cover the subsidy expenses. The detail of subsidy figures is actually available from another answer given to Lok Sabha MP Radhey Mohan Singh, by minister of overseas Indian affairs and civil aviation Shri Vayalar Ravi on 9 March, 2011. The minister added that for Haj 2010, the Government has so far(means till March 2011) released an amount of Rs.580/- crores towards cost of travel of 1,26,191 pilgrims. This clearly means that while government spent Rs 73,526 for Haj yatra of each Indian Muslim(in 2008) selected by Haj committee, that Muslim individual on Haj on his own had to spend only Rs 16,000!! i) Number of Haj Pilgrims to be covered under the Government subsidy scheme for Haj 2011 to be facilited by the Haj Committee of India is 1,25,000.
ii) Fare to be charged from each of the pilgrims for Haj 2011 is Rs.16,000. iii) Haj flights would be operated from 21 embarkation points during Haj 2011.
iv) Ex-post facto approval has been given for increasing the number of pilgrims to 1,26,191 for Haj 2010. Now coming back to Lok Sabha MP Shri Setti Raju alias Devappa Anna’s question about Kailash Mansarovar yatra. Following is the table of central government’s expenses for Kailash Mansarovar yatra. The minister while giving reply about Kailash Mansarovar yatra and central government’s spending for it stated: Government of India has constantly been improving the facilities in India for the Kailash Manasarovar Yatra. Government of India has also been regularly interacting with the Government of China for improvement of facilities in China at the holy sites of Mount Kailash and Manasarovar Lake. This entire piece of article shows that while for Kailash Mansarovar yatra, the government of India spends less than one crore per year, the same government spends 28-30 crore for Haj yatris as other than subsidy expenses and 476-690 crore as subsidy every year! What a person on ground gets from this has to be checked. If Rs 16,000 is just one-way, then Haji pays Rs 32,000 for air fare, but even then the govt spends upto Rs 73,000 for that pilgrim on air fare. Another thing is that govt should have spine to stop funding yatras whether it is Kailash Mansarovar or Haj. Question has already been raised in parliament time and again that why Sikhs are not funded for their Pakistan yatra and Christians for their middle east pilgrim tour! In the following article, the author holds out the spectre of Muslims not cooperating with the national security agencies, if they felt discriminated against. He did not find any need to advise Muslims to introspect for reasons that have led many Americans to be suspicious of their motives. Being an Assistant Professor of law he has tried to make a case for Sharia law, etc., but those who have suffered at the hands of Muslims across the globe, very well know that once given a foothold, they would take over the whole country and ruin it with their backward looking, savage, undemocratic mindset. We see what Afghanistan is, what Saudi Arabia is, what Iran is and what Pakistan is going to be. It is interesting to note that author has used the term Muslim-American twice, instead of using American-Muslim. This reveals the Islamic thinking where the loyalty is not to the nation but to the religion. The very concept of Darul Islam (or Dar al-Islam) and Dar al-Harb, i.e., “Land of Islam” and “House of war” (Land to be conquered for Islam) is at the root of this thinking and reason for worldwide misery caused by its followers. I am not a Republican and am opposed to many of their policies, but I think they are right when it comes to the caution against creeping in of the Sharia law. Those Americans who mindlessly blabber about freedom of expression and freedom of religion, etc. are naive and do not understand that those principles apply only when everyone respects them. By and large, Muslims do not believe in either of those principles; look around the world where they are in power. They use it as a tool to come to the power. Once they have the reigns in their hand, rest of us, Hindus, Christians, Jews, etc. are going to be Dhimis, second class citizens living at their mercy. Democrats and media outlets like New York Times should smell the coffee and do a service to America by not supporting encroachment by Islam before it is too late. WITH an eye toward the 2012 elections, legislators in six states have been debating laws explicitly prohibiting courts from considering or using Sharia law, with 14 more looking at wider bans on “foreign law.” They’re taking a clear cue from Oklahoma’s wildly popular Sharia ban, which voters approved as a state constitutional amendment last year by more than 70 percent. Such laws are discriminatory and pointless. Civil liberties groups are fighting them in court and calling on state legislators to abandon such bills. But there is an additional reason everyone, including would-be proponents of the laws and the federal government, should oppose them: they pose a significant threat to national security. Instead, the bans would deprive Muslims of equal access to the law. A butcher would no longer be able to enforce his contract for halal meat — contracts that, like deals for kosher or other faith-sanctioned foods, are regularly enforced around the country. Nor could a Muslim banker seek damages for violations of a financial instrument certified as “Sharia compliant” since it pays no interest. Moreover, these bans increase bias among the public by endorsing the idea that Muslims are second-class citizens. They encourage and accelerate both the acceptability of negative views of Muslims and the expression of those negative views by the public and government agencies like the police. Such indignities arise amid a pattern of growing animus toward American Muslims. Reports of employment discrimination against Muslims to the Equal Employment Opportunity Commission, which declined after a post-9/11 peak, have recently surged. Gallup, Pew and ABC polls confirm a new spike in anti-Muslim views. Most troubling, tallies of hate crimes collected by nongovernmental organizations show the same trend. In this context, bans like the one in Oklahoma will serve to chill cooperation by the Muslim-American community with counterterrorism efforts. This makes sense: in such an environment, it would be fair for Muslims to pause before, say, passing on a lead to the police, worrying about whether the police would then look at them with suspicion as well. But the likelihood of such a chill is also supported by four large, random-sample surveys that I conducted with two colleagues, Tom Tyler and Stephen Schulhofer. Our data, collected from Muslims and non-Muslims in New York and London, suggest that the experience and perception of private discrimination have a significant negative effect on cooperation. This not only affects everyday public safety, but also the interaction necessary to gather information about self-radicalization and domestic efforts to recruit terrorists. After all, it’s simply impossible for the government to gather all that information. For that it must rely on the public, both as a filter and as an aid in interpreting it. If the government lacks strong ties to the Muslim-American community, that kind of filter falls apart. To prevent the erosion of such support, the Justice Department should better publicize its support for a pending challenge to the Oklahoma amendment. It should also announce that it will challenge similar measures as violations of the First Amendment’s guarantee of freedom of religion. Doing so would not only protect the rights of Muslim-Americans, but also send a signal that they can rely on the federal government’s support. To be sure, Attorney General Eric H. Holder Jr. has taken steps against anti-Muslim bias, for example by supporting a California schoolteacher’s suit challenging her dismissal for taking time off to make a pilgrimage to Mecca. But these steps are inadequate compared to the scope of public and private discrimination facing Muslim-Americans. McGranery’s insight remains true today. The federal government needs to do more to defend equal access to the law regardless of faith. To do so is not simply to uphold our core values — it is also to work to improve our nation’s security. Aziz Huq is an assistant professor of law at the University of Chicago. A version of this op-ed appeared in print on June 20, 2011, on page A27 of the New York edition with the headline: Defend Muslims, Defend America.